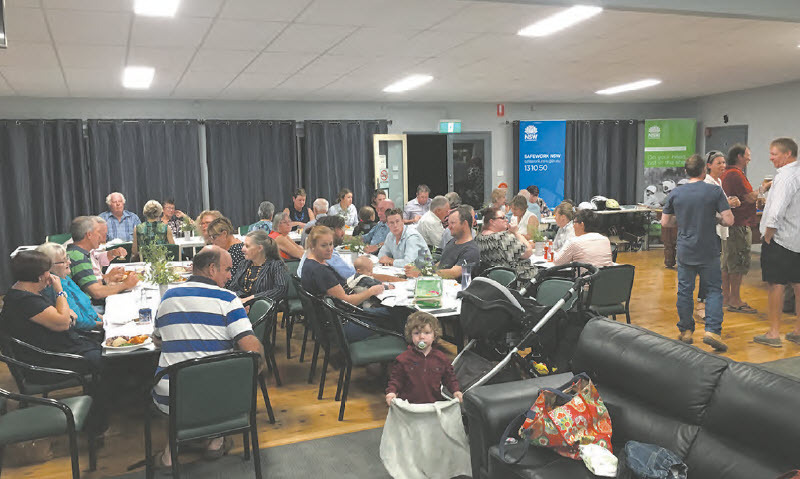 The first three Gwydir Farming Families gatherings held last week, to support drought affected local farmers, have been resounding successes, with a strong attendance at each of the evening events. Over 75 people attended the event at Gravesend on Wednesday night. The next night, 130 turned out at Upper Horton, and 100 people came to the Bingara Sporting Club for the event on Friday night. Gwydir Shire Council was successful in securing a substantial grant to support the local drought affected farming community in response to calls from residents seeking help and advice. The funds were provided by the Hunter New England and Central Coast Primary Health Network. The funding also financed Mental Health Support Skills training. A meal was served at each of the events, and a range of drought assistance services and agencies sent representatives who provided advice and assistance to people who asked. Representatives from different services attended, not the same service at each night, and they did get quite a few enquires. Council’s Marketing and Promotions Team Leader, Georgia Standerwick, said she had received many text messages and phone calls following the gatherings, all of them most appreciative of Council’s organisation of the events. “It is quite heart-warming,” Ms Standerwick said. About 70 people attended the event at Warialda, and a large attendance is expected at the Wallaroo Hotel, Coolatai tonight, Wednesday, April 3. Gatherings at the North Star Club on Wednesday, April 10, and at the Croppa Creek Bowling Club on Thursday, April 11 will conclude the program.